You know how a police siren changes sound when it passes by you? That’s the doppler effect. It works for sound waves and it works for light waves. Astronomers use the doppler effect to study the motion of objects across the Universe, from nearby extrasolar planets to the expansion of distant galaxies. Doppler shift is the change in length of a wave (light, sound, etc.) due to the relative motion of source and receiver. Things moving toward you have their wavelengths shortened. Things moving away have their emitted wavelengths lengthened. Fraser: Astronomy Cast Episode 165 for Monday November 23, 2009, Doppler Effect. Welcome to Astronomy Cast, our weekly facts-based journey through the cosmos, where we help you understand not only what we know, but how we know what we know. My name is Fraser Cain, I’m the publisher of Universe Today, and with me is Dr. Pamela Gay, a professor at Southern Illinois University Edwardsville. Hello Pamela. Pamela: Hey, Fraser, how’s it going? Fraser: It’s good. It’s very cold here. We’re having a very unusual cold snap, so, normally I work upstairs in the winter where it’s nice and warm at the kitchen table… you can see the sun… but, I’m downstairs in my recording studio and got about eight layers of clothing on… gloves… and I wanna get out of here… So let’s get this show over with really quick! Fraser: So you know how a police siren changes sound when it passes by you… that’s the Doppler effect. It works for sound waves and it works for light waves. Astronomers use the Doppler effect to study the motion of objects across the universe, from nearby extrasolar planets, to the expansion of distant galaxies. Ok, Pamela, so let’s use that concept of you standing there and some object is speeding towards you to explain the Doppler effect. Fraser: Right, or like a car engine… like a really loud car engine… Actually, if anyone’s every seen a car race… like a Formula One going past you… oh, you really hear it. Pamela: So, that constant noise is actually made up of a whole series of compression waves through the air where the air molecules get a little bit packed together, and each of these packed-together lumps of air, as they hit your eardrum, they cause it to vibrate and the faster your ear’s getting hit by the vibrations, the higher pitched you hear the noise. Whereas if the compression waves are coming with more time between them, we hear that as a lower-pitched noise. Fraser: Right, ok… so the pitch of the sound that we hear is purely how often these compression waves are bonking into our eardrum. If they’re hitting really quickly, then we hear a high-pitched noise, and if they’re very slowly or not as often, then we hear a lower-pitched noise. Pamela: And the rate at which these waves hit your ear can be affected by how you’re moving, or how the object emitting the sound is moving. So you can imagine that you have a bucket of tennis balls and for some crazy reason you’re running toward a target, throwing tennis balls at the target and every tennis ball you throw, you throw at the exact same velocity. You throw them one per second, but because you’re moving toward the target, each tennis ball has a little bit less distance that it has to travel. So the target that’s getting hit by the tennis balls, it’s receiving tennis balls more frequently than once per second, even though you’re throwing the tennis balls at once per second. It’s that difference in distance that each ball has to travel that’s causing the tennis balls to arrive faster as you run faster toward the target. Fraser: So, right, just to be clear then… this has nothing to do with the velocity of the car moving towards you… it’s not like the sound waves coming off the car are being added by the velocity of the car moving forward, right? Pamela: Right, it’s all about the distance that the waves end up having to travel. The waves are always going to move at the same rate through a given medium. Fraser: The speed of sound, right? Pamela: The speed of sound… the speed of light… and each medium has its own speed of sound and its own speed of light. This is the rate at which waves travel. But, what we’re mucking about with is how far each of these waves have to travel. By causing the waves to either get packed together because the source emitting them is moving towards you, or to get spread apart because if you’re running away from the target, throwing a ball once per second, now each ball has to travel a little bit further. So, you’re spreading out the amount of time that they end up hitting successively the target at. Fraser: Right, right, right… so once again, the actual speed of the waves moving through the air is still the speed of sound. It’s just that you’re putting more distance as you go, and so those waves are having to travel a little more distance and so it feels like they’re hitting at a slower rate… hitting your eardrum… and so you get the lower sound. Fraser: And so that’s why you get that… as the race car is moving towards you, you hear the high-pitched whine. Then as it goes past, then you hear… it sort of gets lower again. So… I’m going to try it… [Fraser’s race car sound effect] Like that! Fraser: Yeah, and that is the Doppler effect. So how does that translate to the universe with light? Pamela: In day to day life, the way that it affects us is objects that are moving towards us… well, each successive wave doesn’t has to travel as far as the one before it. So, we see colors get bluer. Or if it’s an approaching vehicle, we hear the sound at a higher pitch. Now what’s kinda neat is there’s this weird misconception, especially with sound, that an object right near you is going to have its light shifted or its sound shifted a whole lot more. But the reality is that the shift is caused strictly by velocity. So if you have a train coming straight at you at a constant velocity, because it’s coming straight at you, you’re going to hear the pitch always exactly the same. Pamela: Now the reason you hear pitch change, is if you’re standing on a sidewalk and something is about to race past you, that moment that it’s directly in front of you… it’s not moving towards you… it’s not moving away from you… so you hear its sound as if it wasn’t shifted at all. And when it’s very far away, that’s when its sound is shifted the most because the rate at which it’s moving towards you or away from you is the greatest. But, as it gets closer and closer, more of its velocity is in front of you rather than toward or away from you. This is where horizontal velocity and perpendicular velocity start to matter. But, the least amount of shifting occurs when something is moving from left to right. The most amount of shifting comes when something is moving towards you or away from you. Distance doesn’t matter… all that matters is the velocity that something is moving at. Fraser: That’s a really good point, I guess. So, with sound waves, we hear an increase or decrease in the pitch so it sounds like it’s moving faster or moving slower… it’s that change in pitch. So the effect on light waves is the change in color. Pamela: Yes. So, this is the most typical example that people think about. If you were racing towards a stoplight…. as you race toward the light, the red color is getting shifted bluer and bluer and bluer. And along the way to blue, you shift through green. In fact, if you were able to get your vehicle going at a good fraction of the speed of light, you could actually shift the color of that stop light, making it a go light. Fraser: You should totally use that with the cops. If you get pulled over for speeding or running a red light… yeah, I was driving so fast that it shifted to green! Pamela: Yeah, except I’d much rather get a ticket for blowing a stop light than for going that recklessly high of a speed. Fraser: A fraction of the speed of light, yeah… Ok, so as something is moving towards you, its light is shifted towards the blue. So red becomes green becomes blue… and if something’s moving away from you, it gets shifted towards the red. So, blue becomes green becomes red. Pamela: And this is where things that are in the ultraviolet that we couldn’t normally see here on Earth, because our atmosphere tends to block a lot of the ultraviolet, the most distant galaxies in the universe… they’re moving away from us so fast that that ultraviolet light has gone into visible light and into infrared light. Fraser: Yeah, and this is where we talk about the implications of the Doppler effect. So then what are some ways… and we’ve talked about Edwin Hubble, so let’s talk about some of the big ways that the Doppler shift is used in astronomy. Pamela: Well, there’s three main areas that we use it scientifically. One is you can use it the most simplistic way to measure temperature. You can use it to measure how fast things are moving on their orbital paths. You can also use it to measure the expansion of the universe. Fraser: Ok, so temperature… how do they use it to measure temperature? Pamela: Well, if you have a gas, the molecules… the atoms in the gas… are going to be moving at a rate that is determined by the temperature of the gas. So if the gas is very hot, the gas has a lot of energy and the particles in it are moving very quickly. Now, some of those particles are going to be moving towards you, and some of them are going to be moving away from you. If the particles are excited enough that they’re giving off light, those individual particles’ motions are going to cause the light that’s being emitted to not be just seen as a single color, but seen as a whole variety of colors because some of the atom’s light will be blue-shifted, some of the atom’s light will be red-shifted… So you end up seeing the color emitted instead of as a single wavelength, as a spread across several wavelengths. A large-velocity gas will end up with a larger spread in the emitted colors and light that’s cold, that has kind of slow-moving particles, in that case you’re going to end up with a very, very narrow line. Fraser: Sure, this ball of gas we like to call the sun… we would then see, for example, the side of the sun that’s rotating away from us changing… so it’s moving away… and so it gets shifted towards the red… so it gets redder. And then the side of the sun that’s moving towards us would be shifted towards the blue. Then we would be able to calculate how quickly it’s rotating? Pamela: Yes, and we refer to this as line broadening. The faster the object is rotating, the broader the spectral lines are going to be. So it gets very complicated, though, sorting out… ok, this amount of broadening is due to the velocities, and this amount of broadening is due to the rotation of the object, and gravity can also affect line broadening, as well. But at the end of the day, we can start to get at stellar rotation rates by looking at how broad the spectral lines are in the stars. Fraser: And so astronomers can… I’m sure they have methods that they can distinguish between the star is careening towards us, and which is its rotation. Pamela: Right. So, the careening towards us shifts all the lines… their centers go all the way to the red if it’s moving away, all the way to the blue if it’s careening towards us. So all of the lines’ center points get moved. Now if something’s rotating quickly, then each line gets fatter and fatter the faster and faster the object’s rotating. So if you have a star that isn’t moving relative to the planet Earth… it’s not coming towards us, it’s not going away from us, and it’s rotating very fast. You’ll see these nice, fat, spectral lines. Fraser: And how precise is this? Pamela: This is where is starts to get complicated by things like the gravity of the star. You can get order of… I remember making measurements… order of tens of kilometers per second. Some stars are easier than others. It all depends on the surface gravity. Fraser: Right, and just to give you another piece of information… like the Earth… if you’re standing on the equator, you’re going about 1600 kilometers per second hour. So, for you to know within tens is pretty precise. Pamela: And like I said, it all depends on what type of star we’re looking at. But being able to make precise measurements is actually really important because… well, we have the technology to make measurements as precise as one meter per second. That’s the rate at which a human being can walk if they have long legs and they’re moving fairly quickly. Pamela: So we can make that accurate of a measurement. And because we can make measurements that accurate, we can start to look at the back and forth tugs that stars experience due to having planets orbiting around them. Fraser: Right. And this is that next, second big use…. is using the Doppler effect to measure the motion of entire objects—planets, pulsars, you name it, right? Pamela: Right. And with the Doppler effect we’ve gone from the extremes of starting to find Neptune-sized worlds around alien stars, to also finding systems that have a neutron star and a black hole orbiting around each other. It’s all the same science. It’s all looking at how the Doppler shift affects how we receive light. Fraser: And so then how is this different from… we’re detecting how excited particles are releasing photons… in this case we’re looking at how an entire object is moving towards us or away from us…. Pamela: It’s a matter of looking at aggregate behavior. So if we’re looking at random blob of gas… it’s going to have a central velocity… this is all the particles are off-set one way or another. And then relative to that off-set, the particles might have an individual velocity. So you can imagine the bulk motion of a star moving away from us. It might have a bulk velocity of 100s of kilometers per second. Whereas the rate it’s rotating… that has a much smaller effect on top of that that broadens the lines out. So the centers of the lines define the velocity towards or away from us. The width of the line defines the rotation of the object. Fraser: Ok, so then how is this used for discovering planets? Pamela: Well, with the planets what we look at is how is that central point in the line behaving? We know that it’s going to have a general motion towards or away from us, but the way stars that are being orbited by planets move is sort of like watching people square dance where they’re do-si-do-ing while they’re going around a large circle. So you have individuals that as they lock arms, they rotate around each other. But as they go from person to person in the square dance, the contra dance, the choose you’re regional dance of choice, they go round and round individuals while going around a larger circle at the same time. Well, as we look at planetary motion and motion of stars as they orbit around the galaxy, we have the planets basically do-si-do-ing with their star, so the star will appear to move on a very small scale a little bit toward us, a little bit away from us, a little bit toward us, a little bit away from us; while at the same time consistently moving at a much different scale on average always towards us or always away from us. So you might see it moving towards us at, and I’m just making up numbers here, an average rate of 100 kilometers per second. But, some days it’s 100 kilometers per second, minus one or two meters per second. Other days it might be 100 kilometers per second toward us, and then that little extra few meters per second is in the opposite direction. Fraser: Yeah, and this is the gravitational wobbling coming from the gravity of the planet yanking the star back and forth. Pamela: And so what we’re doing is we’re very carefully using Doppler shifting to measure the centers of the lines to see what is first of all the average distance… subtract off the average… then you look at the residuals and look for that do-si-do… that little bit forward, little bit away, little bit forward, little bit away that comes from a planet orbiting another star. Fraser: And this is what has turned up planets in the last couple of decades, and I guess the precision of this technique has gotten to the point now where we’re right on the cusp of being able to find super-Earths… planets with several multiples of the size of the earth… of the mass of the earth… orbiting a nearby star. You can imagine that if they keep refining this technique, we’ll start turning up Earth-sized worlds around other stars. Pamela: One of the neat side ways that this can also get used is it’s not always the individual wave lengths that we look to have shifted. With pulsar planets, we have a neutron star that’s rotating very quickly, and as it rotates, it beams toward and away from us a hot spot… a bright spot that we see as a pulsing on and off. Well, with pulsars, you can look at them and in a few cases they have had planets discovered around them because as the entire neutron star gets slightly yanked around, the time that we receive the pulses gets changed as well. So this is where you can actually start listening to the Doppler shift using radio telescopes. Fraser: Right, right. And so the different wavelengths, in the case of radio telescopes, you can build a great big worldwide telescope array and really take advantage of the size of that wavelength to detect these motions very carefully. But it only works if you’ve got a bright radio source, right? It doesn’t work in the case of a star that isn’t very bright in the radio spectrum. Pamela: Right, so this is something that you do with pulsars, and it’s the same science but instead of looking at individual colors of light, you’re looking at the timing change in the pulse of light that’s coming from the hot spot on the neutron star. Fraser: But that’s very similar to the sound waves bouncing against your eardrum. The pulsar is releasing these radio bursts in a very predictable pattern, then as it’s moving towards you, you’re then seeing them more often. I guess if they wanted they could also measure the wavelength of the radio waves and also detect the motion that way, right? Pamela: That starts to get a little bit more complicated simply because radio waves are so darn big. Fraser: Right, that’s what I’m saying… you have the two ways you could get at it, but one is so much easier to do. Fraser: The timing with your atomic clocks and stuff… Ok, so we talked about the two ways, right? We’ve got the motions of balls of gas, like a star. We’ve got the motions of orbits of planets going around stars and planets going around neutron stars, neutron stars going around black holes… so the third way is the movement of galaxies. This is probably one of the most important discoveries in human history. Pamela: So, as we talked about in our last episode where we discussed Hubble, we live in an expanding universe. And because of the way it’s expanding, things that are nearby… there’s not as much stuff to expand, so we see them moving away fairly slowly. But as you get a little bit further away, there’s now a little more stuff expanding so that object appears to be moving away faster. As you add more and more stuff that’s all expanding, things get to be moving close to the speed of light. We perceive this as a change in the color of the objects that we’re looking at. So we see ultraviolet light that gets shifted into the visible and to the infrared. We start to be able to see wavelengths that normally we’d never be able to see just because our atmosphere doesn’t allow them. But, because of the shifting, they get shifted into visible parts of the spectrum that we can see here on the planet Earth. This simple process has allowed us to do all sorts of different types of science. On one hand, by combining distance measurements using standard candles like supernovae… we had an entire show on that… we’re able to say, ok… this chunk of universe is moving at this speed away from us. This chunk of universe is moving at this other speed away from us. Putting those pieces together, we’re able to say… oh no… insert a few expletives… the universe is accelerating apart. And we know the universe is accelerating apart because of the Doppler shift. Now we can also use this to figure out… oh, there must be a blob of matter over there that we can’t see because we see this flow of material toward a hidden great attractor that lies somewhere beyond the dusty edge of the Milky Way galaxy. We’re able to say… oh, over in this part of space there’s not that much stuff, because the stuff over there… well, it’s not getting held onto tightly enough so it appears to be moving away. Fraser: That’s pretty amazing. It’s almost like you could imagine there’s like a whole bunch of cars all around you, moving away from you. Yet you can kind of tell that two cars off on the right are driving a little off in a funny direction because the pitch of their engines is a little off. It’s just amazing that astronomers have been able to figure out this kind of stuff. Pamela: And this is one of the ways that we paint in very broad brush strokes the distribution of matter in the universe. When we want to get to finer grains, we do other things. Now the one thing that we sort of left out when we were talking about rotations is actually one of the neatest parts of galactic astronomy to crop up in the last ten years, and that’s the discovery of black holes in the hearts of galaxies. We know that we have a black hole in the heart of our own Milky Way because we can see objects whipping around it at ungodly speeds, and it’s absolutely amazing. Andrea Ghez has some really awesome animations that she’s put together. But we can’t resolve individual stars orbiting in the cores of other galaxies. But what we can do, using instruments like Hubble STIS, is take spectra across the cores of other galaxies, and then look to see how one side of that core is racing towards us at high speeds, and the other side of that core is racing away from us at high speeds. Then, we calculate how much mass has to be inside that core to cause these really high-velocity orbits. Fraser: And aren’t they orbiting at essentially the limits that relativity predicts? They’re essentially moving at close to the speed of light… as fast as possible. Pamela: As we start looking at the gas particles down in the center accretion disks, we have to use every ounce of relativity that we know to start to explain all of these different velocities. And what’s amazing is that they’re actually able to start looking at some cases at the cores of galaxies and going ah ha… we know that the super-massive black hole in the center must be rotating because of how we see the material in the accretion disk moving. Pamela: This actually moves even beyond Einstein because Einstein, Schwarzschild, they all liked to work in a system where black holes didn’t rotate, and rotating black holes just make the whole universe a lot more complicated. Fraser: Perfect. One last question for you… where does the term Doppler come from? Pamela: From a dead white dude. Fraser: Ah, so it’s named after somebody. Pamela: Back in 1842, a now-dead white dude by the name of Doppler wrote a treatise on how he thought that this probably ended up working. You know, if you come up with a really good idea and you happen to be the first person to publish on it, sometimes you get lucky. This particular paper had a really long name that’s German, and I’m not going to humiliate myself by trying to say it. He was actually looking at binary stars, and he was making predictions about how the orbits of binary stars would affect the perceived color of the light. Fraser: Really? So that was thought about more in terms of light than of sound? Pamela: We had a steam cars back then, but to really start worrying about sound a lot, you need race cars. Fraser: That’s really interesting. Alright, well thanks, Pamela. Fraser: Alright, we’ll talk to you next time. Hello. That was an interesting point about the Doppler shift being discovered in the examination of light, not sound, because there wouldn’t have been anything like a car (train, maybe) to observe the phenomenon. But, a Doppler shift can be observed in horse racing. Each hoof in a 10-horse race, for example, generates a sound pulse creating an uneven low-frequency but audible and continuous tone that is raised in pitch as the horses approach and lowered after they pass and recede. I estimate the difference would be a semi tone, and noticeable if you pay attention to it and you stand right beside the rail. You can also notice the individual hoof beats of a single horse or a a few in a smaller race become discernibly slower as they pass, but that’s not Doppler shift . . . is it? Imagine an entire cavalry advance coming toward you . . . 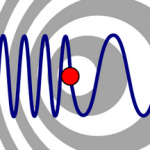 Thank you so much for sharing this wonderful Doppler Effect resource.